I decided to take yesterday off, so today was just the minimum on what would normally be two days. Since I can't squat at all, I dedicate a day to rows. Normally this would mean doing many different row variations, but today I was crunched for time since I did my workout in the morning. I'm trying to do at least one training day in the mornings so that I have more of the evening available for housework and spending time with my wife. It also gives me the benefit of getting to train with one of my training partners more often. I started doing seated overhead press as a main movement about a month ago, due to some knee pain that had been bugging me for a long time. 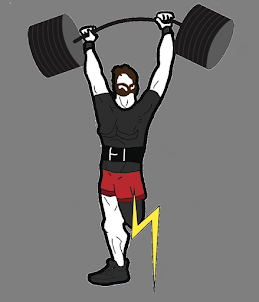 It seems like the pain might have been related to losing my balance at the top of really heavy overhead press reps, where I would shift most/all of the weight to my meat leg. Now I'm doing standing as an accessory movement, and it doesn't seem to have suffered. I lowered the weights a bit today due to not being used to training so early in the mornings yet and needing to not spend so much time between sets today. This is one of my favorite movements. It allows me to do moderate-heavy weight for high volume without tearing up my legs and hips. Today I decided to go with 10 sets of 10 to keep things simple.